Danny Kight shares with you the secrets of effective kickoffs. In this program, you’ll see warm-up drills and stretches, foot placement, the approach, following-through, workout regimens and of course, the crucial techniques for getting the ball downfield. Regarded as one of the most powerful kicking specialists in pro football, Danny Kight reveals his personal secrets to achieve tremendous hang time and distance on kickoffs! 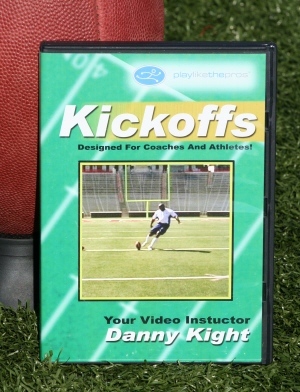 Danny Kight shares with you the secrets of effective kickoffs. In this program, you’ll see warm-up drills and stretches, foot placement, the approach, following-through, workout regimens and of course, the crucial techniques for getting the ball downfield. Regarded as on of the top kickoff specialists in the NFL, Danny Kight has played for Washington, Indianapolis, Baltimore and in the NFL Europe.